It is a well-known fact that when wood loses or gains water, it shrinks and swells. The moisture content of plywood and OSB structural panels is generally 2 to 8 percent when manufactured. 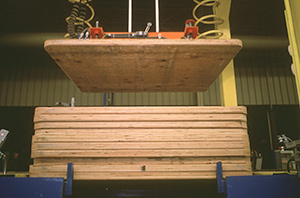 When acclimated to ambient conditions or when exposed to elevated humidity or wetting after manufacture, the resultant increase in moisture content can lead to dimensional increase in thickness, length and width, but APA testing shows plywood and OSB exhibit greater dimensional stability than other wood-based building products. The shrinking of solid wood along the grain with changes in moisture content is about 1/20 to 1/40 of that across the grain. Therefore, for structural panels, the tendency of individual veneers or layers to expand or shrink crosswise is greatly restricted by the relative longitudinal stability of the adjacent plies. 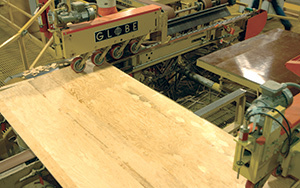 Expansion of a plywood panel that is free to move consists not only of a uniform expansion across the width and length, but also additional swelling at the panel edges. Edge swelling is independent of panel size and varies with the thickness of veneers having grain perpendicular to the direction of expansion. For identical veneer thicknesses, this expansion is about twice as great for the face ply as for the inner plies. For panels of balanced construction, edge swelling could reach a maximum of about 0.002 inch at each edge for each 10 percent increase in equilibrium relative humidity above 40 percent. The average coefficient of hygroscopic thickness swell is about 0.01 inch per inch of original thickness for each 10 percent change in equilibrium relative humidity. In normal conditions of dry use, relative humidity may vary between 40 and 80 percent, with corresponding equilibrium moisture contents ranging from 6 to 14 percent. Total dimensional changes of a 48x96-inch panel exposed to this change in conditions may be expected to average about 0.05 inch across the width and 0.09 inch along the length. Three conditions of shape distortion constitute warping: cupping – when the axis of deformation is parallel to face grain; bowing – when the axis of deformation is perpendicular to face grain; and twisting – when one corner of a panel is bent out of the flat surface plane. Warping can be prevented by proper panel storage, including cutting the bands on bundles to prevent edge damage if moisture absorption is expected, by storing panels on three or preferably more evenly spaced stringers, and by weighting down the top panel in a stack to help avoid damage from humidity. Proper attachment of the panels to framing will typically pull a warped panel flat. The ultimate performance of the panel is normally not compromised by warping or cupping. Certain plywood constructions (combinations of veneer thickness) exhibit greater resistance to warping than others. The ideal construction has about 50 percent of the veneers running in each direction and is assembled in a balanced manner about the central plane. As a general rule, the greater the number of plies, the better the stability. For most applications, a minimum space of 1/8 inch should be provided at panel ends and edges to allow for expansion due to pickup in moisture content. When spacing recommendations are not followed, there is increased possibility of unsightly appearance due to panel buckling. The thermal expansion of wood is much smaller than swelling due to absorption of moisture. Because of this, thermal expansion can be neglected in cases where wood is subject to considerable swelling and shrinking. It may be of importance only in assemblies with other materials where the moisture content is maintained at a relatively constant level. Plywood and wood expand upon heating, as do practically all known solids. The thermal expansion of wood, however, is quite small and requires exacting techniques for its measurement. The effect of temperature on plywood dimensions is related to the percentage of panel thickness in plies having grain perpendicular to the direction of expansion or contraction. The average coefficient of linear thermal expansion is about 3.4 x 10-6 inch/inch per degree F for a plywood panel with 60 percent of the plies or less running perpendicular to the face. The coefficient of thermal expansion for panel thickness is approximately 16 x 10-6 inch/inch per degree F.
Wood structural panels are typically uniformly flat, making them a good choice for many applications. Concerns about warping can be alleviated by proper storage, handling, application and selection of panel grade and manufacture.